Nowadays, the development of mechanical engineering is featured by the continuous accuracy improvement of machine parts as well as perfecting the geometric shape of blanks. Shape deviation of cylindrical surfaces significantly affects the contact rigidity, wearing qualities, impermeability, noise and other performances of the equipment. The consideration of accuracy problem aims at providing accurate manufacture of machined parts, as well as analyzing the reasons for errors in treatment, which depend on the technological effectiveness factors. Radial cutting force makes the greatest affect in comparison with other factors. One way to improve the accuracy of treatment is to reduce forced vibrations and deformation of machine tool units. The paper presents the research of elastic deformation impact of cylindrical grinding machines on the treated surface accuracy. A 3D model of the blank machine-treatment has been designed. The strains and stresses of the technological system under cutting force have been calculated by finite element technique. Keywords: the method of finite elements, the elastic deformation, the cutting force, grinding accuracy. Novoselov Y.K. The dynamics of surfaces formation by abrasive machining. – Saratov: Saratov State University, 1979. 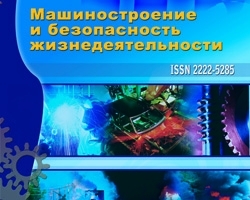 – 232 p.
Aljamovskiy A.A. Engineering calculations in SolidWorks Simulation. – Moscow: DMK Press, 2010. – 464 p.
Lomova O.S., Lomov S.M., Morgunov A.P. Precision machining for cylindrical grinding machines: Monograph. – Moscow: Publishing Center «Mechanical Engineering», 2011. – 176 p.